St. Vincent’s University Hospital, Elm Park, Donnybrook, D4, Ireland. There are a number of clinical decision instruments to assist risk stratification of PE. These include the Simplified Geneva Score (SGS) and the Well’s PE Score1,2. Patients deemed to be low risk using the SGS and the Well’s PE Score still require further investigation, namely a DD test3. A negative DD in a low risk patient is considered sufficient to exclude PE4.The DD test is far from ideal as it has a low specificity, leading to a false positive rate of 50% or more5. A number of publications have shown that DD levels increase with age6,7,8. Consequently the clinical usefulness of this test declines in the older patient population who are more likely to have a positive DD8. Douma et al derived a DD value cut off point for use in patients over the age of 50 who have an unlikely clinical probability of having PE9. They report that age adjusting DD to low risk groups over 50 years of age can safely reduce the number of false-positive DD results by up to 18% with no substantial increase in the false negative rate9. Recently it has been demonstrated that the prospective application of AADD in combination with pretest clinical probability assessment was associated with a larger number of patients in whom PE could be considered ruled out10. We applied the concept of AADD to a retrospective cohort of patients presenting to two Dublin EDs in order to assess its applicability in the Irish context. This retrospective cohort study was carried out in the ED’s of two large tertiary referral hospitals in Dublin; St Vincent’s University Hospital (SVUH) and the Mater Misericordiae University Hospital (MMUH). Both institutions use the PE Well’s score to risk stratify patients prior to any investigation11. Those at moderate and high risk usually proceed to advanced imaging without DD testing as per Well’s clinical model12. Patients deemed to be a low risk for PE using the PE wells score are further risk stratified using DD. The primary outcome of the study was to calculate the diagnostic characteristics (sensitivity, specificity etc.) of AADD in this patient population. Secondary endpoints included determining the current PE positive diagnostic rate prior to risk stratification with SGS and the current use and documentation of the Well’s PE score. In order to determine which patients would be appropriate for AADD we used the SGS as described by Klok et al to estimate a pretest probability13. As Well’s PE score puts a heavy weighting on the subjective assessment (“is PE the most likely diagnosis”) we chose to retrospectively apply the SGS score. We considered a SGS >2 equivalent to the Wells 'PE likely' category. A list of all ED CTPA requests was obtained from the hospitals’ Radiology Information System. This study analysed requests in SVUH between July 2012 and April 2013 and all the ED CTPA requests in MMUH in 2013. There were two lead data abstractors (DM and AN), one in each hospital. In SVUH 4 other abstractors in addition to the lead abstractor, all of whom were not blinded to the study hypothesis, were used to review the electronic records of patients. Each abstractor reviewed 10 patients electronic records in the presence of the lead analyst to ensure consistent reporting. The lead analyst was available at all times to answer any questions to ensure consistency. A 10% sample of patients was randomly selected from each hospital using online software (http://www.random.org). This sample was abstracted by a second study author (AM) in MMUH and by (AMcF) in SVUH one of the abstractors in SVUH and agreement was measured. Patients were excluded from the study if they were <50 years of age, had no DD testing in the ED, had a negative DD(<500ug/ml), had incomplete patient notes or had their CTPA more than 96 hours following presentation to ED. Data collected included; clinical outcome, age, DD value, AADD (calculated by data abstractors), CT result and SGS. In those patients who had a negative DD after age adjustment a SGS was calculated based upon the patient’s notes by data abstractors. AADD value was calculated based upon the method outlined in the Douma et al study. This same method was subsequently used in the Righini et al 2014 study10. A 10 μg/l increase per patient year was deemed to be an appropriate new DD coefficient. Starting from the conventional cut-off point of 500μg/l until the age of 50, for older patients the patient age should be multiplied by 10 to calculate the age adjusted cut-off value. For example, a 75 year old man who was low risk for PE would have an AADD cut-off value of 750μg/l. In total there were 756 CTPAs performed over the study period. There were 371 CTPA’s performed in SVUH ED and 385 in MMUH ED. After application of exclusion criteria, there 185 patients in the final cohort (Figure 1). The mean patient age was 69.75 years and there was an overall positive diagnostic rate of 12.46% amongst this low risk patient cohort (Table 1). Twenty-one of the 185 patients had a DD ≥500ug/L but less than the AADD cut-off. Of these one had a PE, corresponding to a failure rate of 4.76% (1 in 22). The sensitivity and specificity of AADD is shown below (Table 2). Of the 99 in SVUH included in the final cohort 8 patients had a negative AADD (Table 3). Of these 8 (8%) none had a PE. The PE prevalence rate in this cohort of patients was 12.1%. There were 11 patients whom had negative AADD but chart review suggested there SGS was high and therefore imaging was indicated. In MMUH of the 86 patients in the final cohort 13 had a negative AADD and a low SGS. Of these 13, 1 patient had a confirmed PE on CTPA. The single false negative AADD was in an 83 year old female who AADD was 820ug/ml. She had multiple segmental level pulmonary emboli on imaging. Secondary endpoints included determining the current PE positive diagnostic rate and the current use and documentation of the Well’s PE score. Tirty-eight patients were randomly selected from the list of CTPAs done in MMUH, this represented 10% of this cohort. A second abstractor (AM) abstracted these to calculate SGS and to detect presence of exclusion criteria. There was 82% agreement on SGS and 95% agreement on exclusion criteria. Similarly, 37 patients were randomly selected from the list of CTPAs done in SVUH, also representing 10% of the patient cohort. An abstractor (AMcF) found a 92% agreement on SGS and 97% agreement on exclusion criteria. The diagnostic characteristics of AADD were calculated and are shown in table 2. Our results show that one PE would have been missed had AADD in combination with low SGS score been introduced. The “ADJUST- PE” trial by Righini et al which prospectively applied AADD to low risk patients had a much lower failure rate of 0.3%10. A study which looked at retrospective application of AADD across 4 countries showed similar failure rates (0.2%- 0.6%)9. Our higher failure rate of 4.76% (1 in 22) is clinically significant in comparison with the literature. This high failure rate may be due to our small sample size and were there to be greater numbers in our study, our results may more closely reflect the literature. The positive diagnostic rate in the final patient cohort is 12.5%. Had the AADD rule for low risk patients been implemented, this figure would have risen to 14%. Our secondary endpoint was to determine the PE positive diagnostic rate prior to risk stratification with SGS, and the use and documentation of the Well’s PE score . This was 17.3% and 14.6% respectively. This positive diagnostic rate is below the EU average but above that of the USA14. With regard to Wells score documentation, commonly risk factors for PE were listed by physicians and/or a Wells risk group assigned without a Wells score calculation. Runyon et al noted that clinical gestalt estimation appears to function well, however clinicians tend to overestimate disease prevalence15. It however has also been shown that there is considerable inter-observer variation16. Some studies suggest that small pulmonary emboli without physiologic strain appear to be very common and have an extremely low mortality rate17,18. Anticoagulation is routinely prescribed to treat a PE, but a Cochrane review found only one controlled trial testing its use as treatment in VTE19. Given the sparsity of evidence the risk of using it may actually outweigh the benefit20. Any strategy that aims to detect all pulmonary emboli will likely result in more harm than good if one considers the risk of radiation, contrast and anticoagulation versus the low mortality rate from pulmonary embolism in patients without physiological compromise20,21,22,23. The harms of treatment can be substantial, including in the worst case death, it is imperative that we do not turn the problem of under-diagnosis into one of over-diagnosis24. Therefore, AADD’s failure rate of 0.2%- 0.6% reported in the literature may be acceptable to patients to whom AADD applies and when presented to them by clinicians in discussion of the benefits and risks of further investigation using a shared decision model. There are a number of limitations of our study. It is a relatively small study with only 185 patients in the final cohort after application of the exclusion criteria. There was poor documentation of Wells score (14.6%). It is unclear why there is a low recorded use of Wells score, but this may explain the below average positive diagnostic rate compared with Europe. Common risk factors for PE were listed by physicians and/or a Wells risk group assigned without a Wells score calculation. Calculation of the sensitivity and specificity of AADD (table 2) gave rise to broad confidence intervals suggesting an inherent imprecision of the result. Abstractors were not blinded and there may have been incomplete agreement on chart review. The fact there were more than one abstractor in each hospital may give rise to intra-observer variability. We calculated agreement to take into account this possibility. Finally, the fact that this study was done retrospectively is a limitation and opens it to bias (e.g. information bias). The introduction of AADD testing may be an important step in reducing over testing for PE. There has been an observed rise in PE incidence with minimal change in mortality and lower case fatality since the introduction of CTPA, which suggests over diagnosis24. AADD in combination with a risk stratifying tool has been shown to be both retrospectively and more recently prospectively safe9,10. It is hoped that its implementation in the near future may help obviate the trend towards over- investigation, diagnosis and treatment21,24. The results of our study show higher failure rates than prior studies which may be due to the small numbers involved. Further study is indicated to accurately define the diagnostic characteristics for the Irish context. David Monks, Emergency Dept, St. Vincent’s University Hospital, Elm Park, Donnybrook, D4, Ireland. 2 Frederikus A. Klok, MD; Inge C. M. Mos, MD; Mathilde Nijkeuter, MD, PhD; Marc Righini, MD, PhD; Arnaud Perrier, MD, PhD; Grégoire Le Gal, MD, PhD; Menno V. Huisman, MD, PhD. Simplification of the Revised Geneva Score for Assessing Clinical Probability of Pulmonary Embolism. Arch Intern Med. 2008;168(19):2131-2136. 3 Paul D. Stein, MD; Russell D. Hull, MBBS, MSc; Kalpesh C. Patel, MBBS; Ronald E. Olson, PhD; William A. Ghali, MD, MPH; Rollin Brant, Rita K. Biel, BSc; Vinay Bharadia, MSc; Neeraj K. Kalra, MD. D-Dimer for the Exclusion of Acute Venous Thrombosis and Pulmonary Embolism: A Systematic Review. Ann Intern Med. 2004;140(8):589-602. 5 Cecilia Becattini, Alessandra Lignani, Luca Masotti, Maria Beatrice Forte, Giancarlo Agnelli. D-dimer for risk stratification in patients with acute pulmonary embolism. J Thromb Thrombolysis. 2012 Jan;33(1):48-57. 6 Righini M, Goehring C, Bounameaux H, Perrier A. 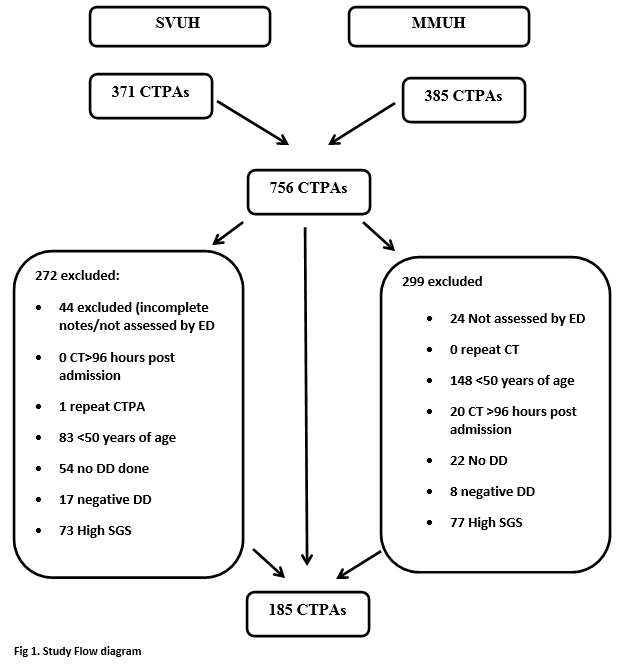 Effects of age on the performance of common diagnostic tests for pulmonary embolism. Am J Med. 2000;109(5):357-361. 8.Tardy B, Tardy-Poncet B, Viallon A, Pierre Lafond, Y. Page, Christophe Venet, Jean C. Bertrand. Evaluation of DD ELISA test in elderly patients with suspected pulmonary embolism. Thromb Haemost. 1998;79(1):38-41. 9 Douma RA, le Gal G, Söhne M, Marc Righini, Pieter W Kamphuisen, Arnaud Perrier, Marieke J H A Kruip, Henri Bounameaux, Harry R Büller, Pierre-Marie Roy. Potential of an age adjusted DD cut-off value to improve the exclusion of pulmonary embolism in older patients: a retrospective analysis of 3 large cohorts. BMJ. 2010;340:c1475. 10 Marc Righini, Josien Van Es, Paul L. Den Exter. Age-Adjusted DD Cutoff Levels to Rule Out Pulmonary Embolism The ADJUST-PE Study. JAMA. 2014;311(11):1117-1124. 11 Wells PS, Anderson DR, Rodger M, Ginsberg JS, Kearon C, Gent M, Turpie AG, Janis Bormanis, Jeffrey Weitz, Michael Chamberlain, Dennis Bowie, David Barnes, Jack Hirsh. Derivation of a simple clinical model to categorize patients probability of pulmonary embolism: increasing the models utility with the SimpliRED D-dimer. Thromb Haemost. 2000 Mar; 83(3):416-20. 12 Wells PS, Ginsberg JS, Anderson DR, Kearon C, Gent M, Turpie AG, Bormanis J, Weitz J, Chamberlain M, Bowie D, Barnes D, Hirsh J. Use of a clinical model for safe management of patients with suspected pulmonary embolism. Ann Intern Med. 1998; 129:995–1005. 13 Klok FA1, Mos IC, Nijkeuter M, Righini M, Perrier A, Le Gal G, Huisman MV. Simplification of the revised Geneva score for assessing clinical probability of pulmonary embolism Arch Intern Med. 2008 Oct 27;168(19):2131-6. 15 Runyon, M.S., Webb, W.B., Jones, A.E. & Kline, J.A. (2005) Comparison of the unstructured clinician estimate of pretest probability for pulmonary embolism to the Canadian score and the Charlotte rule: a prospective observational study. Academic Emergency Medicine, 12, 587– 593. 16 Rodger, M.A., Maser, E., Stiell, I., Howley, H.E. & Wells, P.S. (2005) The interobserver reliability of pretest probability assessment in patients with suspected pulmonary embolism. Thrombosis Research, 116, 101–107. 18 Donze J, Le Gal G, Fine MJ, Pierre-Marie Roy, Olivier Sanchez, Franck Verschuren, Jacques Cornuz, Guy Meyer, Arnaud Perrier, Marc Righini, Drahomir Aujesky. Prospective validation of the pulmonary embolism severity scale index. A clinical prognostic model for pulmonary embolism. Thromb Haemost. 2008;100: 943-948. 21 Newman DH, Schriger DL. Rethinking testing for pulmonary embolism: less is more. Ann Emerg Med. 2011;57:622-627. 22 Hurwitz LM, Reiman RE, Yoshizumi TT, Goodman PC, Toncheva G, Nguyen G, Lowry C. Radiation dose from contemporary cardiothoracic multidetector CT protocols with an anthropomorphic female phantom: implications for cancer induction. Radiology. 2007 Dec; 245(3):742-50. Epub 2007 Oct 8.